People have been lining their coffers for years by selling their purported knowledge of dog behavior and training techniques to gullible “owners” of unmanageable mutts. So, with all due respect to capitalizing on capitalism, I can disclose to you a few free simple secrets of addressing what people view as bad dog habits. This is not to detract from the “expertise” that’s out there…OK, it is. I advise you to ignore the experts and adhere to the following abridged rules which will result in happier, more well-adjusted dogs, and human beings who know how to please their pets. Hmmm, I think I’ve talked myself into jumping on the bandwagon. So, start with the three rules below. For a more comprehensive view, you’ll have to wait for my dog training book, “Make Your Dog Happy, and Forget About Your Selfish Needs For Once”. 1. Digging. Understand that your yard is now the dog’s excavation field. It is a place where dogs can exercise their archaeological and other exploratory talents. Digging can also expose hidden IEDs and other dangers, saving the family from disaster. For example, on the fifth of May I was digging in the yard and discovered a sink hole in which my family would have undoubtedly perished. My discovery became known locally as the Sink Hole de Mayo. But I digress. If the dog is attempting to tunnel under the fence, you should ascertain the reason; there is invariably a legitimate justification for tunneling. The grass could be greener over there, or there could be great food, romance and adventure. (Sound familiar? Think ‘vacation’.) In other words, the dog’s OK.
2. Jumping. Jumping is almost as natural to dogs as watching TV is to humans. Get over it. Teach your young, elderly and disabled to brace themselves for impact. Perhaps you could hold out a treat and give the dog something to jump for other than your body. In addition, a couple of pair of Nike Air Lassies would be a nice gift for your jumping dog, to cushion the impact when he lands on your hard flooring. In other words, the dog’s OK.
3. Failing To Heel. Most people get dragged on walks with their dogs. They return home with dislocated shoulders, leash burns on their hands, miserable attitudes and vows that the experiences will never be repeated (but they always are). I could tell you how to make your dog heel, but where’s the fun in that? Instead, I advise you to purchase one of those leash extension devices and set the leash to play out for – oh, about 2 miles. That way, it feels like you have some control, you are conforming to your county’s leash ordinance, and most importantly, the dog is not forced to act like your conjoined twin. In other words, the dog’s OK.
Get the idea? See you at my book signing. 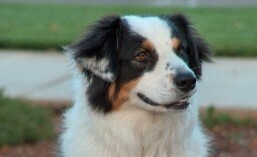 This entry was tagged aussie, blog, digging, dog, dog training, heeling, humor, jumping. Bookmark the permalink.